This Ronson magazine advertisement was published in Life magazine on the 29th of November, 1968. 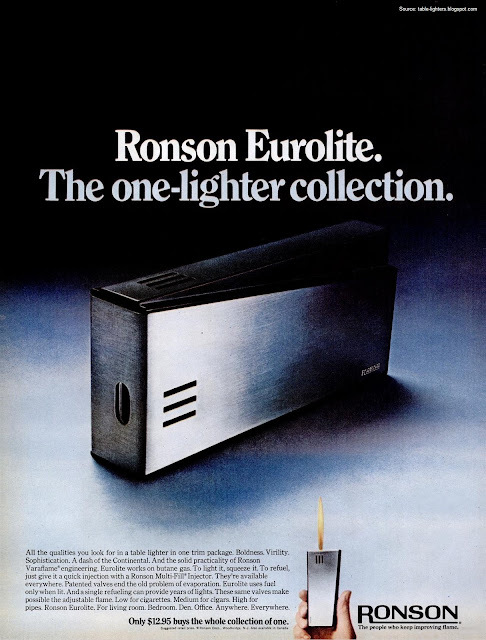 It depicts the Ronson Eurolite Varaflame Table Lighter. Great simple design. 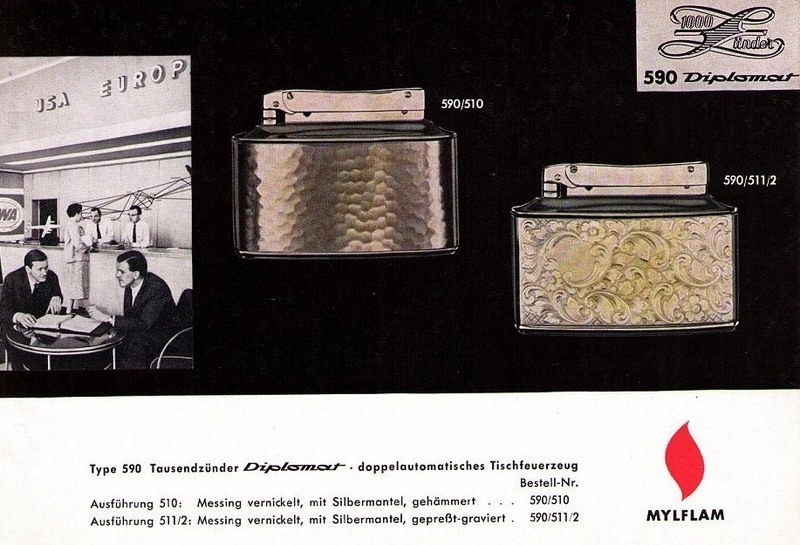 This Zippo advertisement was published in the LIFE magazine on the 4h April 1954. 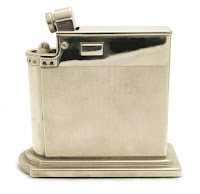 Below the Zippo Barcroft # 4 Table Lighter is depicted. 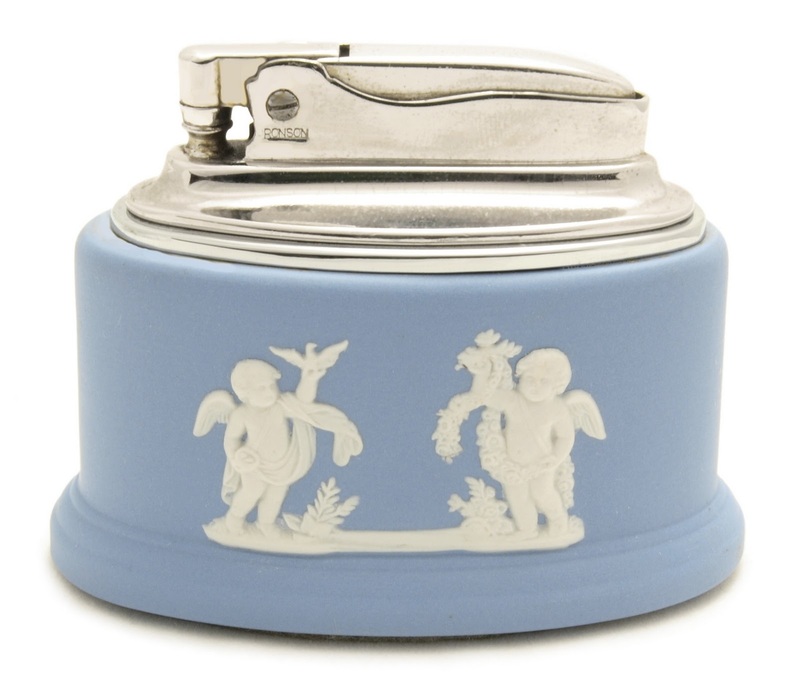 This wick table lighter – Ronson 'Four Seasons' – was made in 1956 in England by Ronson and Wedgwood. Wedgwood is a British pottery firm, founded on May 1, 1759 by Josiah Wedgwood (1730–95). The company still exists and is noted for its numerous innovations and high-quality wares that achieved renown throughout the world. Wedgwood's name is synonymous with the Jasper Ware body type. The main themes on the company's jasper ware have all been taken from ancient mythologies: Roman, Greek or Egyptian or Italian Renaissance and Baroque The initial decision to have antique designs was probably that as Britain entered an age of great industrialization, the demand for luxurious goods subsequently exploded. Meanwhile, the archeological fever caught the imagination of many artists. Nothing could have been more suitable to satisfy this huge business demand than to produce replicas of artefacts. Wedgwoods pottery is very collectibles nowadays. 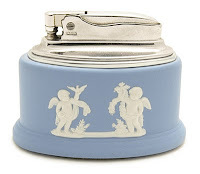 The Ronson Wedgwood 'Four Seasons' has a chrome plated Adonis lighter insert which is mounted in Blue Jasper base made by Wedgwood with overlaid design – putti in four seasons scenes – in white ceramic. The lighter base is padded with light blue felt. 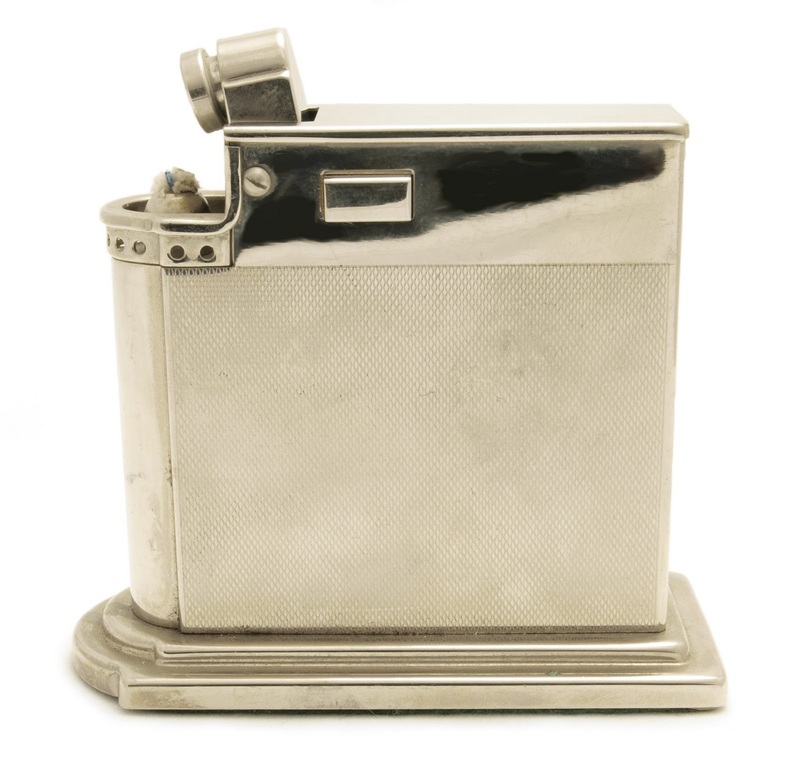 This cigarette lighter was also sold with matching ashtrays. The 1000 Zünder Diplomat Table Lighter (model 590) was first manufactured in 1955 in Frankfurt, Germany by the famous German company Mylflam. This automatic petrol lighter was marketed in many different finishes like: silver/nickel plate, brass, various types of leather, (delivered by Richard Maltner) etc. It was also commonly used for advertising purposes. On the right we have an used example of the1000 Zünder Diplomat. It is made of brass and then nickel plated. For decoration purposes the base is manteled with silver (.835 purity) which is hammered and marked. See the Mylflam magazine advertisement below (source). The patented mechanism gave the owner the possibility to hand it over without extinguishing the flame. This Ronson table lighter was manufactured in 1954 in a limited quantity. It is special because of the designer of the porcelain base – Harold Sitterle – famous American designer born in 1921. His works are now very collectible. 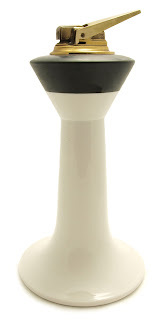 Some of his (and his wife Trudi Sittelre) works – like the Pepper Mill, Ashtray, Salt Dish and Spoon – are in the collection of the Museum of Modern Art. 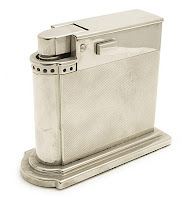 This lighter was also available as a set including an ashtray (like a simple plate) also designed by Harold Sitterle. 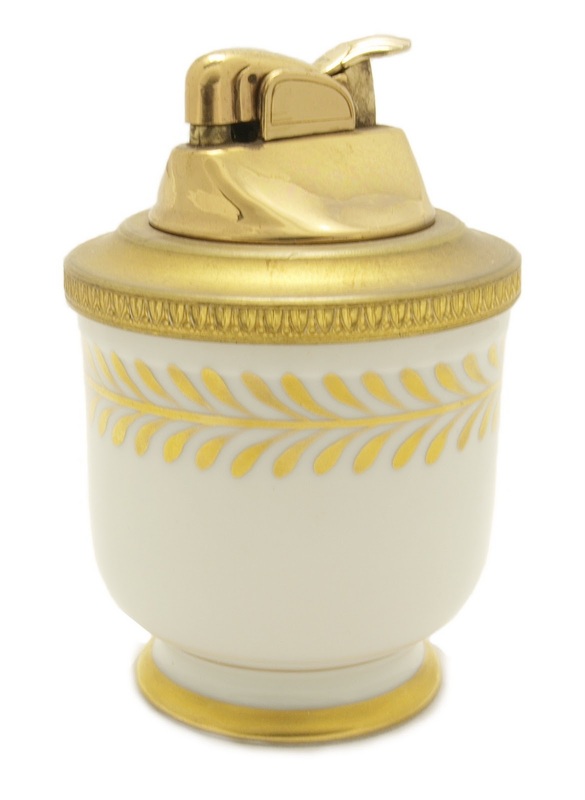 This French porcelain table lighter decorated with delicate hand painted floral bouquets on a white background framed in gilt scrollwork was manufactured in cooperation with Evans U.S.A. in 1956. Evans provided the gold-tone brass insert and the Limoges Castel Porcelains factory the white glazed porcelain base. 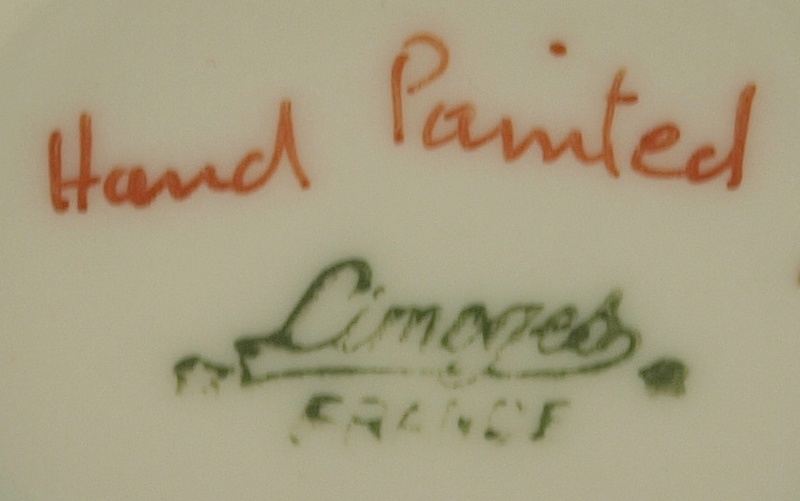 The green Limoges FRANCE mark was used by Limoges Castel Porcelains between 1955 and 1979. They were known for manufacturing Limoges boxes which were decorated mostly with transfers. The factory was established in 1944 and is still active today as a part of Haviland Co. The Rowenta Table Lighter was the first cigarette lighter manufactured by Rowenta Werke in Offenbach, Germany. It was manufactured in the 1940s in Germany. 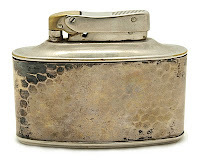 This wick semi-automatic pertol lighter was manufactured in many different finishes, like: sterling silver, chromium plate, nickel plate (see picture), various leather, engravements etc. D.R.P stands for Deutsches Reich Patent. Patented by Karl Maltner. The lighter mechanism is very efficient. To make it lit the rectangle button on the side has to be pushed. 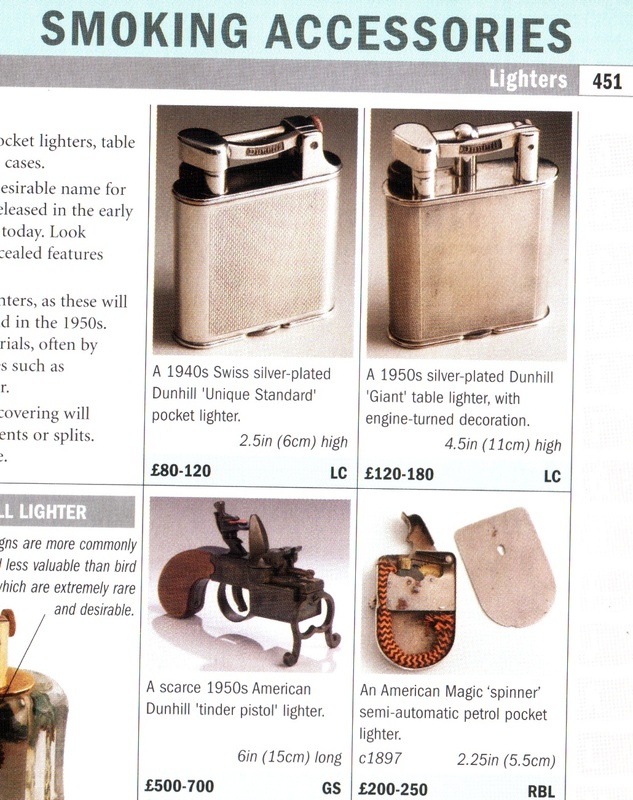 I receive a lot of requests connected with appraisal of table lighters that were not described yet. Determining the price of a specific item is very difficult and one can give only a rough estimate. Why? Because you are supposed to be able to guess how much a buyer may pay for it within a specific period of time and sales conditions. Our market is not a perfect market. Mainly because perfect and global market information simply does not exist. It changed a lot due to the development of Internet but it is still not ideal. The price range for the same item may vary a lot. It depends among others on your focus group - who are you going to reach with the information that you want to sell it? Will you list your item on ebay? Yes? Then in what country? Or maybe an auction house would be better? Or selling it to your nearest antiques dealer or friend?... Well, everything depends on a lot of factors. In each case you might be almost sure that you will receive a different amount of money for you item.